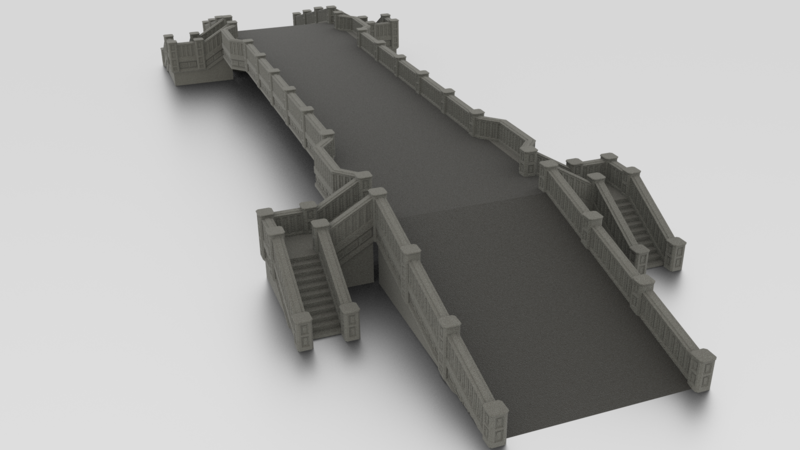 Here are a few of the latest ideas for add-ons to the basic bridge design. We are trying to make the bridge as versatile as possible, being able to represent as wide a variety of bridges as it possibly can. We started with a new add-on deck section that has several openings in it which can be used for multiple configurations. In the base model it would simply be a pair of side entry stairs and a slight bump out in the railing to form a “scenic overlook”. These stairs would be reversible so they could face either direction desired. With the railing section removed, a bunker can be added for defense of the bridge. This could be done to either or both sides of the bridge depending on what is wanted for that particular game. If the roof of the bunker is removed then it would also be possible to add a second story and a parapet to the bunker. This would then create a flack tower to further enhance the defenses of the bridge. We will also have a second option for the abutment that we have been working on. The level abutment would be useful for things like crossing ravines or raised roads. Since the abutments are interchangeable it will also be possible to do a bridge where one bank is higher than the other.